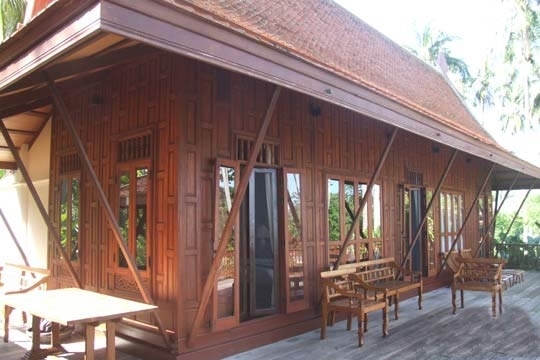 The aroma of aged teak is a constant reminder of the antiquity that surrounds you at Baan Sairee, one of just a handful of authentic Thai style properties on Samui. 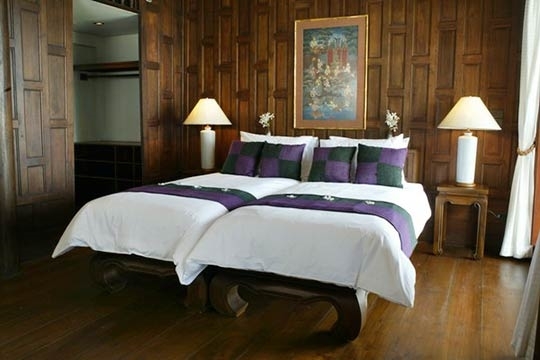 Baan Sairee was created as a labour of love, with the owners importing every panel and pillar, from the north of Thailand. Great care has been taken to retain all the buildings' original simplicity but with subtle additions, like modern bathrooms, to enhance the experience. 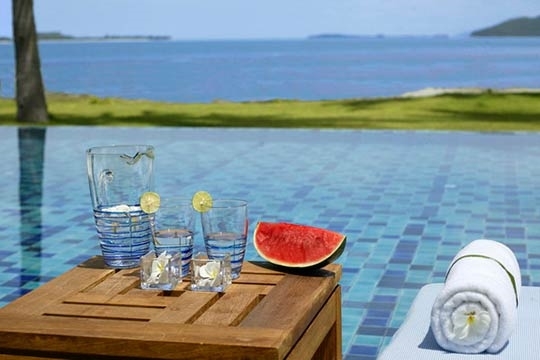 Rustic but comfortable surroundings inspire you to emulate colonial pursuits, such as reclining in a planter's chair with good book and a gin and tonic, and a 15m beachfront swimming pool is the perfect spot for cooling down under the tropical sun. 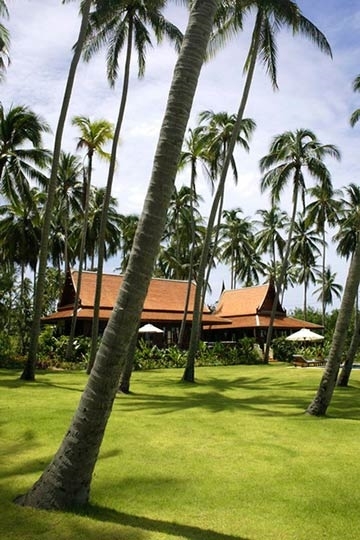 A team of dedicated staff cater to your every whim at Baan Sairee, adding to the princely ambiance. Breakfast is usually taken on the terrace and afterwards the villa manageress enquires as to your meal requirements for the rest of the day, offering choices from an extensive suggestion menu or taking specific requests for the private chef (provisions are charged to guest account). 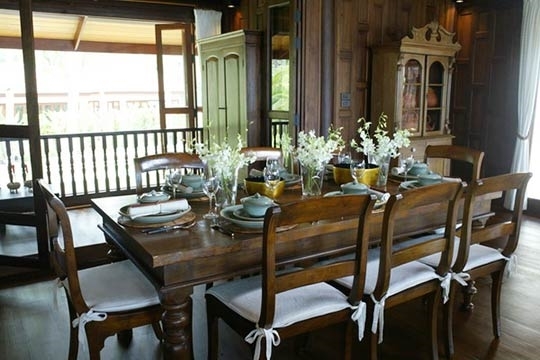 Baan Sairee is particularly appealing for a group of two or three families, as each could occupy their own building, with plenty of spill-over room for the kids in the newly added (2013) ‘Kids’ barn. 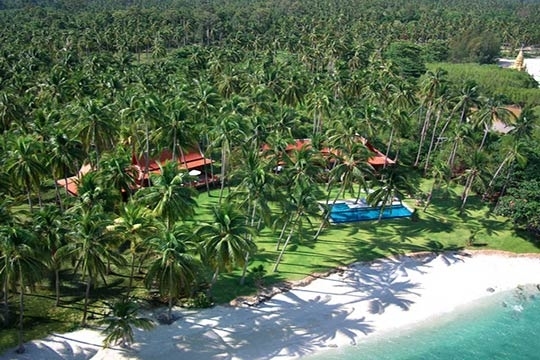 The beachfront lawn doubles as an extended private playground with pool, tennis court and a fenced trampoline. This allows adults to relax on one of the terraces or by the pool while the children explore and play. The sea is a little shallow with a lot of rocks but during high tide it's still possible to swim. A pleasant sweep of sand stretches west from the villas, perfect for a spot of private sunbathing or an evening stroll. 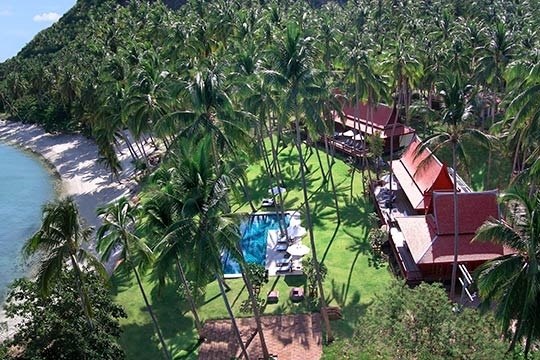 Baan Sairee is on a secluded bay, the hinterland peppered with private villas and small residential compounds. The only significant landmark is the Laem Sor Pagoda, just a few minutes’ walk across the headland. This beachside temple is dedicated to local fishermen. There's little else to see or do in the immediate vicinity other than enjoy the beach and views. There are no main settlements close to the villa. This very secluded, yet surprisingly long stretch of narrow beach is home to a handful of private villas, modest resorts and restaurants. The area has thus far held on to its quaint, tropical charm and offers fabulous views over to the offshore islands of Koh Matsum and Koh Taen. At one end of the bay, a famous beachside Pagoda sits on a small rocky headland providing the area's main landmark. It attracts both tourists and local people and on special Buddhist holidays, monks and villagers gather to pray, sit and eat in the shade of the surrounding trees, creating a festival atmosphere. Back from the beach, a small community of islanders includes local fishermen plus foreign residents who came in search of a peaceful life. Further around the headland, reachable by road, the traditional fishing village of Tong Krut offers a glimpse of local life as it used to be with small boats mooring to unload their daily catch. 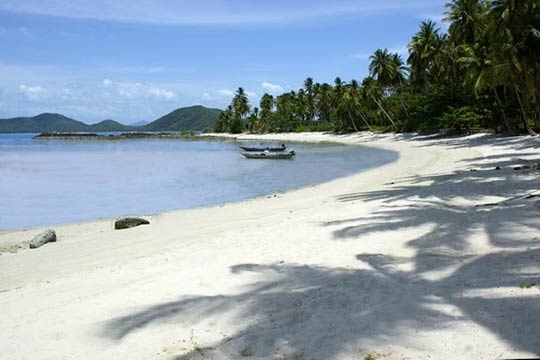 Snorkelling trips off the nearby island of Koh Taen can be arranged from there. Humble shops and local restaurants line the beach and provide an excellent source of fresh seafood. Lamai (10km) is the nearest real town with resorts, shops and restaurants offering everything from Thai staples to fine international cuisine. 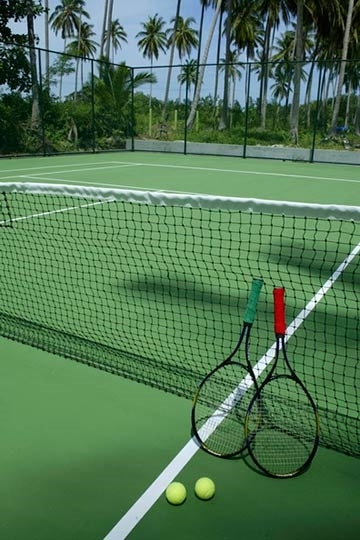 From a hidden, walled entrance with private car parking, Baan Sairee’s expansive grounds open out to a well-kept lawn and private tennis court. At the front of the property, facing the 15m swimming pool, are two almost identical teakwood villas, each housing a living, dining and kitchen area and three bedrooms. All rooms look out over the garden and ocean beyond. 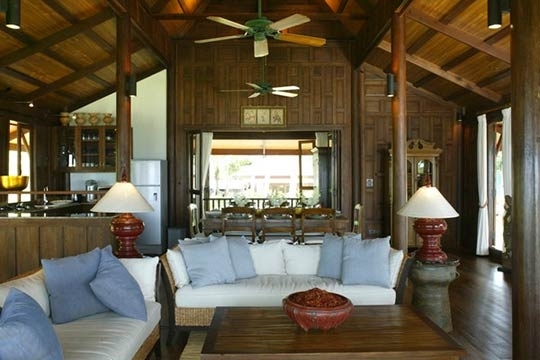 The fan-cooled, open-plan living spaces are decorated with original Thai artefacts and boast vaulted ceilings, solid teak tables and chairs plus two comfortable water-hyacinth sofas facing out onto verandas. A modest but fully-equipped, recessed kitchen space in each house is used to prepare breakfast (there's a staff kitchen at the back of the property where the in-house chef prepares larger meals). Behind the living areas, adjoining TV rooms with built-in sofas and wooden AV cabinets add a modern touch. These decks link the living pavilions to the sleeping pavilions, the latter containing three bedrooms each: a twin, a single and a double master bedroom, all with ensuite bathrooms. 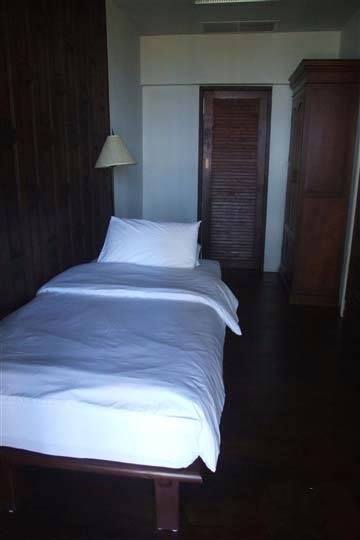 All the bedrooms are air conditioned and decorated with antique furniture such as wooden writing desks, lamps and carvings. Double doors and mosquito screens make the most of the sea views and breezes. The twin and double bedrooms have walk -in closets, modern fitted bathrooms with bathtubs and ceiling skylights. 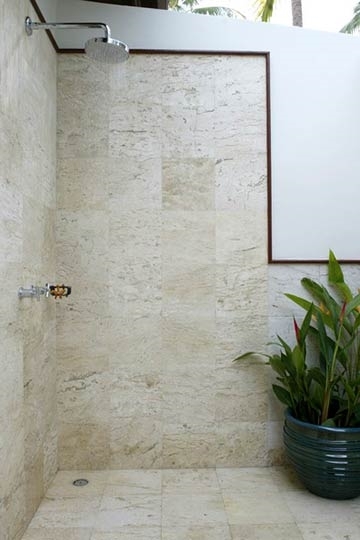 A sealed glass door near the bath opens into a spacious outdoor rain shower. 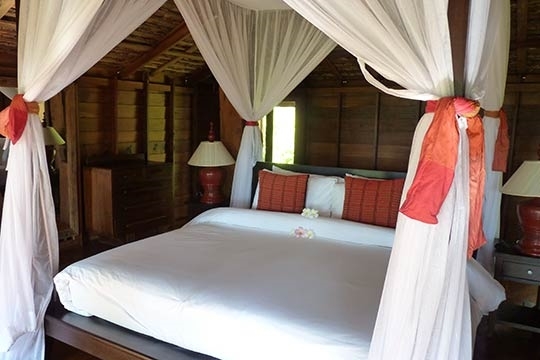 The middle bedroom in each villa is smaller, essentially designed as a children's room, with a single bed and small ensuite shower room. Two traditional Thai-style ‘barns’ on high stilts, have recently been added to Baan Sairee in the garden behind the main villas. 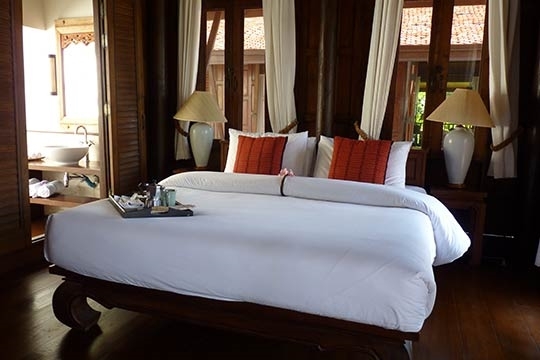 One is known as the honeymoon barn, and boasts a romantic king-size four-poster bed, with elevated sea views. 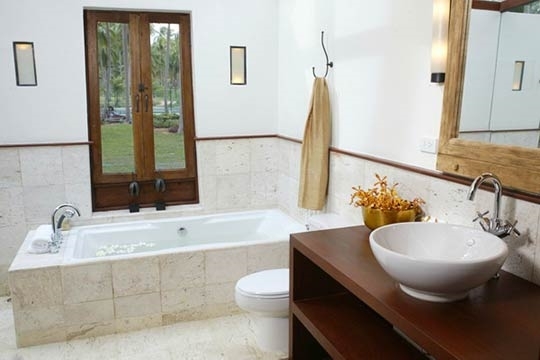 The ensuite bathroom has an open-air shower, and the room has its own lounge area. The kids’ barn is similar in style, but smaller and houses two sets of bunk beds and a cosy lounge area for children to enjoy the PlayStation or watch DVDs away from the adults. An extra bed can be made up here for a nanny. 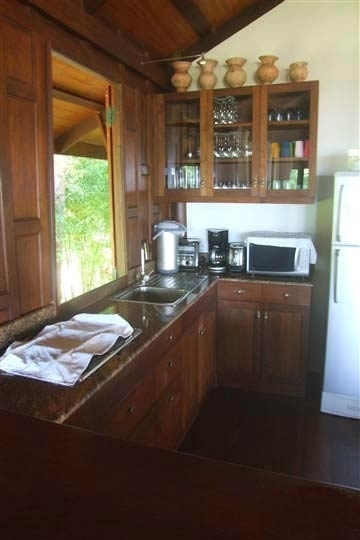 Lower rates are sometimes available for this villa if 3 bedrooms are used. Contact Customer Service for details. Additional children may be charged extra. 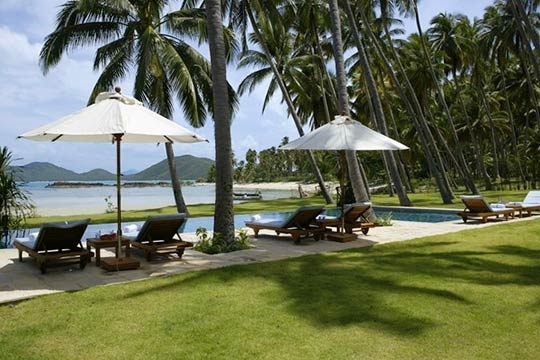 6 bedroom villa located in Laem Sor, Koh Samui. Ideal for Beachfront, Body and soul, Bring the relatives, Kid friendly, Gastronomic delights, Fair share for groups, The great outdoors, Party pads, Sensible for seniors, Room with a view, Perfect for weddings.